Darion M. Coronado acquainted himself to the world of guitar at the age of 15. His introduction to music was by ear, and completely self-taught. He quickly developed his skills and gravitated towards genres associated with electric guitar such as rock, metal, and blues and spent his adolescence gigging throughout the Central Valley. At the age of 19, he entered Merced Community College where he formally began his music education with theory, history, and instrumental performance (guitar, piano, voice). He performed extensively in jazz ensembles and combos, guitar orchestras and quartets, and as a classical guitar soloist. Simultaneously, he began imparting his knowledge to a diverse array of students, and developed a vocation for teaching to rival his desire for performance. He took time away from his education to hone his ability to effectively instruct others, and push the boundaries of his playing abilities. During this time, he also developed a unique system of teaching that implements online supplementary instruction, as well as integration of music media platforms in addition to individual instruction. In 2015, he pursued higher education at California State University, Fresno where he studied jazz theory and improvisation, flamenco, and conducting while developing advanced classical guitar technique. 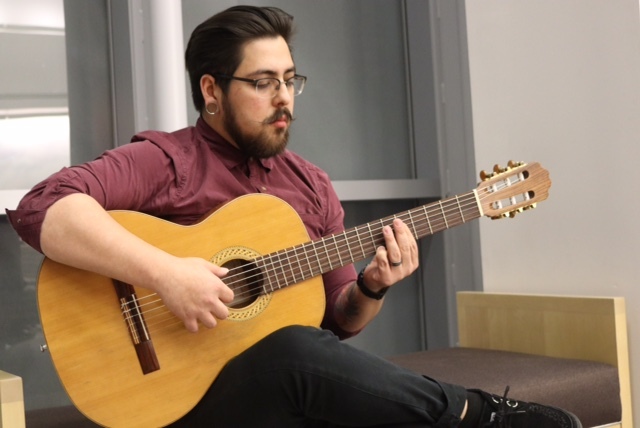 Mr. Coronado has earned honorable mentions at the annual Gohar & Ovanes Classical Guitar Competition, and 2nd place at the first Juan Serrano Guitar Competition. He has performed in masterclasses with Lito Romero, Mark Teicholz, Peppino D'Agostino, Jaume Torrent, Daniel Bolshoy, and Richard Savino. He holds a B.A. degree in Instrumental Music Performance: Guitar from California State University, Fresno, and an A.A. in Music: Guitar from Merced College. Currently, he continues to perform and educate in Fresno.